Cook the rice according to packet instructions and tip into a large tray to cool quickly. Meanwhile, beat the eggs with the sesame oil; set aside. Heat the vegetable oil in a wok or large frying pan over a high heat. 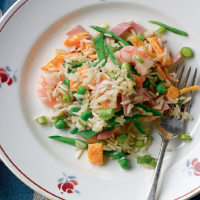 Add the rice and stir-fry for 2 minutes, then add the prawns, ham and peas, and cook for another 2 minutes.